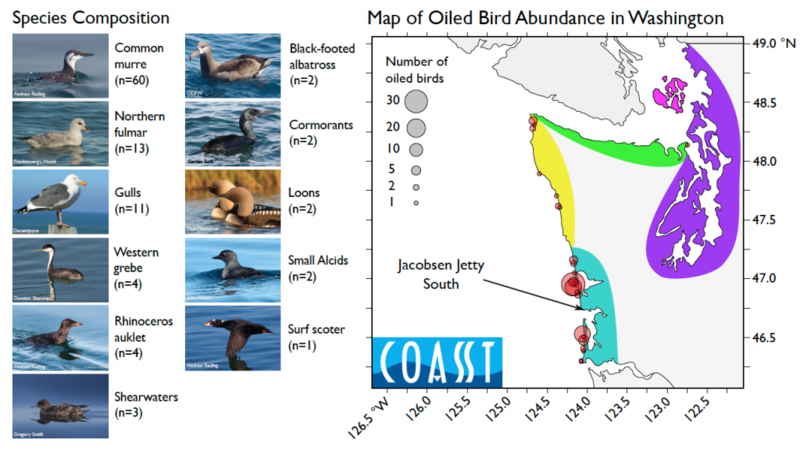 When Michael, one of our new COASSTers, found oil on his survey at Jacobsen Jetty South (Tokeland, WA) last month, we decided to take a closer look at the oiled birds in the COASST dataset. How many oiled birds has COASST found over the years, and where? What is the risk of chronic oiling, the type of oiling that might result from small spills like the one Michael documented? Since 2000, COASSTers have documented 125 oiled birds: 3 in California, 4 in Alaska, 15 in Oregon and a whopping 103 in Washington. But absolute numbers don’t tell the whole story! There are also a lot of unoiled birds found along the outer coast of Washington. To generate an index of chronic oiling risk, we divided the number of oiled carcasses found by the total number of carcasses found, per state. Washington is still in the lead, but Alaska is now second! Oiling rate by state (separating out Salish Sea and Outer Washington locations) with higher rates indicative of relative risk of chronic oiling, regardless of how many carcasses have been found overall. This analysis allows direct comparisons between birdy states, like Washington, and states like Alaska where the chance of finding a beached bird in some locations is basically zilch. (For the statistically-minded, we’ve subtracted the mass mortality events out of the baseline signal, so we’re truly comparing baseline to oiling). What’s the story in Washington? 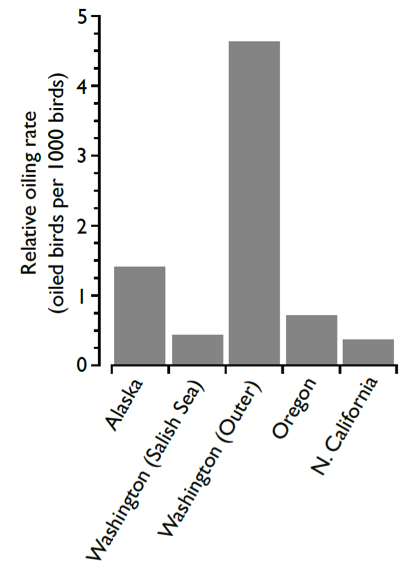 Why so many oiled birds relative to elsewhere (3 times higher risk than Alaska, 6 times Oregon and 11 times California)? The map below indicates that almost all of the oiled birds found by COASSTers in Washington have been along the outer coast (only one oiled bird has been found in Puget Sound, just at the entrance of Admiralty Inlet), and most of those have occurred on the Long Beach peninsula and in the Gray’s Harbor/Ocean Shores area. A second smaller cluster of oiling can be seen on the beaches immediately south of Cape Flattery. We suspect a combination of shipping activity concentrated at the Columbia River and at the entrance of the Strait of Juan de Fuca, boating activity in the vicinity of the two large southern estuaries, and coastal oceanography bringing Columbia River water close to shore along the southern half of the Washington coastline (but not the Oregon coastline). What washes in oiled and where in Washington, the state with the overwhelming majority of oiled carcasses (82%) COASSTers have found. Jacobsen Jetty South, where Michael recently reported an oil spill, is right in the middle of the highest oiling region, the southern outer coast. Circles are scaled to the number of oiled birds found – a few beaches are approaching 30 oiled carcasses, in total! What washes in oiled and where in Washington State – the state with the overwhelming majority of oiled carcasses (82%) COASSTers have found. Jacobsen Jetty South, where Michael recently reported an oil spill, is right in the middle of the highest oiling region, the southern outer coast. Circles are scaled to the number of oiled birds found – a few beaches are approaching 30 oiled carcasses, in total! Of course, the spill Michael encountered at Jacobsen Jetty South reminds us that chronic spills are not necessarily the result of a vessel actually discharging oil, or oily bilge water, but can be the result in inadvertent loss of oil-filled containers, or even malicious dumping once the debris reaches shore. Although large oil spills get most of the press, the vast majority of spills in any year are small ones. One study released by the Washington Department of Ecology showed that between 1991 and 1996 there were 100 documented oil spills. Only 4 were large (>100,000 gallons). Half were 100 gallons or less, and three-quarters were 1,000 gallons or less. And finally, which species are oiled? Not surprisingly, murres, fulmars and gulls top the list, accounting for ~80% of all oiled carcasses found. We’re not surprised by this because murres, fulmars and gulls also collectively rank as the top three species or groups in the COASST dataset. In fact, there is a pretty strong relationship between oiling numbers and total numbers. The only species that falls outside of this relationship is Black-footed Albatross. At 186 Black-foots found to date, we’d not expect to see even a single oiled carcass, let alone two. Wondering what to do if you find a fresh oil or hazardous material spill on your beach? Check out this post for details on how to make a report! This entry was posted in Beached Birds on 21. April 2017 by coasst.